Week 16 of the NFL regular season schedule has been completed, giving us an even larger sample size to delve into just how each of the 2018 NFL Draft first-round picks has fared in their respective action so far. Some of the 32 first-rounders have not qualified for a grade either based on small snap counts or not playing altogether. On the other hand, some players have jumped out of the screen and have helped strengthen their teams. 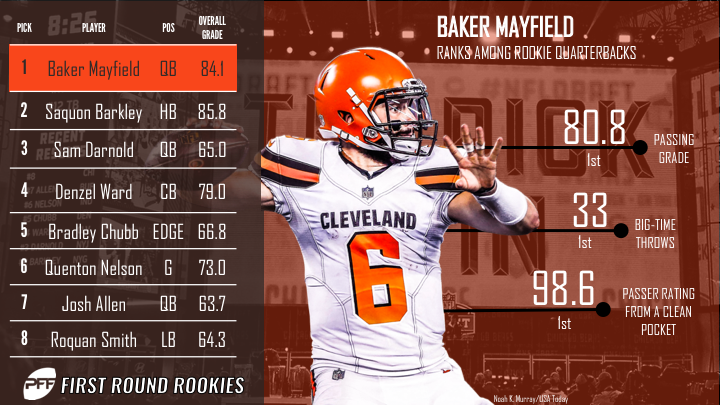 Mayfield was electric from start to finish in his team’s Week 16 win over the Bengals, and he ended the game with an overall grade of 86.8, the second-best single-game mark of his career. The former first overall pick was lethal when he was kept clean from pressure this week and completed 21 of his 29 attempts from a clean pocket for 175 yards and three touchdowns, all good for a passer rating of 122.1 — the seventh-best mark of the week. In Week 16, Barkley was kept in check by an underrated Colts defense, and he was never really allowed to get anything going. He ended the day with just 43 rushing yards from 21 carries, at an underwhelming average of 1.52 yards after contact per attempt — the second-lowest single-game mark of his career. Darnold followed up a terrific Week 15 performance with yet another strong showing in Week 16. Like Mayfield, Darnold was at his very best when he was kept clean from pressure, and completed 22-of-29 attempts from a clean pocket for 315 yards and three touchdowns, all good for a passer rating of 145.0 which was second among quarterbacks this week. There was a little bit of rust on Ward as he took the field for the first time since Week 13, but he still managed to make his mark on the game. In total, he logged five solo tackles and a defensive stop on his 41 defensive snaps, and he allowed three catches from five targets for 35 yards on throws into his primary coverage. Through 16 weeks, Ward has allowed a passer rating of just 70.7 on passes thrown into his coverage, which is the 10th-best mark among the league’s qualifying cornerbacks. Along with a number of his teammates, Chubb never really got going on Monday night. He did manage to tally three hurries from 21 pass-rushing snaps and a defensive stop against the run, but overall, it wasn’t his best game as a Bronco.